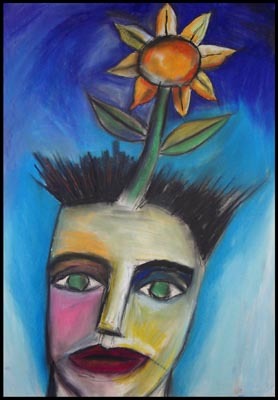 ILLUSTRATION: "Flower Bursting From My Head" © 2006, pastel illustration by Dee Rimbaud, Glasgow, Scotland. ARTIST AUCTION ENDS JUNE 30! Permission to reprint this image granted by the artist. "Flower Bursting From My Head" is one of 40 artworks available by Dee Rimbaud on post cards, greetings cards, posters, t-shirts, mugs, mouse mats, fridge-magnets etc, produced by CafePress.com—see the entire range at http://rimbaud-products.blogspot.com. A Motley Vision || William Morris's "Criticism: Mormon Magic Realism? Is it possible to make a magical realist film? What is Magical Realism, Anyway?